Over at the Mormon Women Stand website, Angela Fallentine has an excellent article entitled “Chipping Away at Priesthood Authority of Mormon Prophets to Undermine Faith“. Angela is one of the founders of Mormon Women Stand and has worked in international and public affairs for both the LDS Church and private organizations. Several years ago, I received an assignment to work in the Scheduling Office of the Quorum of the Twelve Apostles. This particular office is located in the Church Administration Building and is surrounded by the offices of various apostles and general authorities. I would arrive at my desk by 7:30 a.m. each morning and it wasn’t long before I started to notice that Elder Joseph B. Wirthlin, whose office was just down the hall, was always getting to work a little earlier than my 7:30 a.m. start time. I knew that he was in his 90’s and in a wheelchair, but yet there he was. Elder Wirthlin passed away several weeks later and his example left an indelible impression on my heart about dedication and the ways in which the Lord sustains our prophets, seers and revelators. Nothing keeps them from doing the Lord’s work for the duration of their life—and I guarantee that they wouldn’t have it any other way. Since the beginning of time, the adversary has stirred up the hearts of those in Christ’s church against the prophets and apostles in veiled (or unveiled) criticism about their fallibility, age, or human frailties as a way of chipping away at their authority and weakening faith. Yet it’s comforting to know that despite this, Jesus Christ is at the head of this Church. He calls specific men to these sacred positions because He is the One with the authority to make these divinely inspired callings. He is in charge. We are not. We also know that because, “No one knows how to work a crowd better than the adversary,” it shouldn’t surprise us to find that there will be smooth and subtle ways to undermine and lessen the authority of the prophets, seers and revelators. Read Angela’s whole article here. Great post! It is so sad that Satan has deluded people into thinking that criticism of the Lord’s annointed is God’s will and beneficial to the spreading of the gospel. Nothing could be further from the truth. Wonderful thoughts and testimony. Thanks for taking the time to gather all these quotes together, and in a meaningful way. I’m with you–I trust the apostles. And I believe that almost all active members of the church do too. What’s unfortunate is that the few dissenters are disproportionately vocal, especially on the internet. It’s good to hear from a sustaining, faith-promoting voice. Wonderful post! Well said and correct on all the points! Thanks for the wonderful reminder of how we can sustain our leaders. Excellent exposition of the authority of our leadership along with explanation of the fail safe integrated into the organization. There was a time a few years ago now when someone suggested a particular leader was unwell. When I heard that story, it didn’t bother me that this leader might be unwell, but I decided to watch and see how the leader comported themselves. The leader has continued to perform their duties well. So from that, I drew the conclusion that the folks portraying the leader as unwell were either uninformed, gullible or subversive. When I was young, President Kimball was the prophet, and they built a building at BYU named after him, the Spencer W. Kimball Tower (SWKT). As I sat through the dedication, I was so sad, because everyone was being so worshipful that it was almost as if President Kimball were already dead. There’s a term for that kind of over-the-top adulation: hagiography, a record about someone’s life that makes it seem better than it really is or was. And then President Kimball’s son stood to speak. In short order, we were all laughing. I particularly remember Ed Kimball’s tale about when President Kimball was told they would be naming a building after him. “Make sure it’s a tall building,” the short and raspy-voiced prophet had said. There’s a difference between speaking true tales about a leader and subverting a leader. Those who are subversive don’t appreciate this difference. Criticizing the leaders is like criticizing your spouse or children. I love a story I heard once, of a young couple. She was past the honeymoon glow and really wanted to let her young man know exactly how far from perfect she now knew he was. So she suggested that they have a session where they each said everything they thought about how the other was falling short. She went first, and her list was long. He patiently listened, and she was delighted to see that her words were having an impact, as his shoulders drooped and he became increasingly pensive. When she was done, she said, “And now it’s your turn.” And she likewise braced for the unpleasant truths, though she was pretty sure she didn’t have much he could find fault with. And he was telling the truth. And she realized that her honesty hadn’t been as honest as she supposed. One can imagine how the evening went from there (hint, it went well). Some who are critical of the Church of Jesus Christ of Latter-day Saints enjoy chatting among themselves on podcasts such as Mormon Matters and Mormon Stories. It is informative to listen to them. The tendency is, at times, to congratulate themselves and like-minded people on their originality of thought and to dissect-in-detail much of what comes from Church leadership. Although they do not use the exact words spoken by Korihor in Alma 30 as he dissected the teachings of the ecclesiastical leaders of his day, they do fall into that “type.” Korihor spoke of the “frenzied mind” and “derangement of your minds” (See Alma 30:16) of his leaders…not dissimilar to the tone and line of thinking of some today. Recent chatter, which Ms. Fallentine addressed in her fine article, has to do with criticisms of the age and health some of our Church leaders. Teenage members of the Church might worry about this, but many of us that have been around fifty plus years do not. Despite the usual frailty of a few members of the Quorum of Twelve and First Presidency as they age and go “the way of all the earth,” the Church marches on. It does now, it did anciently. Historically, the covenant people never went astray because the prophets aged. It was because they, as a people, ceased to follow what the “aged” prophets had taught. As many church members who struggle in life, but want to keep the covenants we made and repeatedly reaffirm both outside and inside the Temple, we appreciate the encouragement and teachings that come from the leadership we choose to sustain. The teachings of our modern prophets and apostles do not always fit neatly into the intellectual constructs of the millions of Church members, including my own. Nonetheless, I want to leave a record of gratitude to them for what they provide: clarity in teaching the way of the Savior and the path toward eternal life for my family…encouragement in living difficult but freely made covenants. In their age and frailty, in the “weak and simple…manner of their language” I have been brought back to the fold repeatedly that I “might come to understanding” (D&C 1:23-24) of what is of most value in life and how to obtain it. How nice that you’ve paid such close attention to Elder Oaks’ teachings. Without looking it up–can you cite, from the same talk, the five procedures Elder Oaks proposes that are available for an individual who wishes to address his or her differences with Church leadership? I find it interesting that so many in the ‘nacle insist that there is division and disagreement at the level of the 12. Let’s just say that this is true…. That would makes their public unity the perfect example of loyal opposition that these same ‘naclites should be showing! If there really is loyal opposition at the top level that we can emulate, then, we should also emulate the privacy that marks such disagreements. I can’t remember anything without looking it up. When addressing my differences with the Church leadership, I just wing it. But mostly I just really like them. Even the time Elder Oaks visited our ward, and was therefore presiding, and it was discovered that no one had brought sacrament bread, and the usual back-up stash wasn’t there. So we all sat reverently for 20 or so minutes until someone had time to run home, grab a loaf, and return. At which point, we began the meeting. Not a fantastic reason to remember one of the few times an apostle has presided at a meeting I’ve attended. Meg, I think JimD’s question was addressed to me, but I don’t remember either. It was in a PBS interview. I think Elder Oaks was speaking as much for himself as anyone else. As an intelligent, opinionated man I’m sure he would have his disagreements with others in the quorum. But he subverts them within the higher authority of consensus. We know this is true from Pres. McKay’s administration from Rise of Modern Mormonism, which demonstrates that disagreements among the 12 were frequent, and occasionally bitter. But all of them came to consensus, not because they changed their mind, but because consensus is more important than their personal opinions. Just like Elder Oaks, we could personally disagree with something a GA says, or with a particular policy or direction. But there is a difference between criticism and disagreement. Disagreement can still acknowledge and sustain the divine authority of the consensus. I think people at BCC, FMH and W&T can discuss disagreements with the brethren, as long as they are trying to find ways to personally subvert their will to the consensus, or acknowledge its divine authority and mandate as higher than their own. Personally, I disagree with the brethren’s orientation towards political agitation regarding SSM. But I respect their divine authority to pursue it as an acceptable sacrifice unto The Lord. I think disagreement is our prerogative, and can be done faithfully. I still consider their orientation to be “the will of The Lord” inasmuch as God declared “whether by mine own voice or the voice of my servants it is the same.” But I also think that God bears me up, understands and accepts my own understandings as real with their own kind of limited validity. God doesn’t want us to be unthinking robots or blind sheep. He just wants us at the end of the day to join hands together. What an awesome post. I love it. I’m going to keep a copy for future reference. Thanks for posting. JimD, thanks for the link to the talk. I was quite impressed by it. Thanks for sharing the Dallin Oaks talk. So relevant right now. Expressing disagreement, holding people accountable to the principles that they advocate, and pointing out logical fallacies, inconsistencies, and contradictions in one’s reasoning aren’t criticism as far as I know. Criticism seems to be more on the lines of, ‘he is an idiot,’ or ‘his ideas are stupid.’ But when you are making a true observation that you can back up with evidence, then that is not necessarily criticism. In fact, people who do that are contributing to advancing the cause of truth, which is what the LDS church is all about. Steve, why don’t you give us an example of what kind of “disagreement” with prophets you think is valid and what kind is not. An example I’ve mentioned a couple of times recently is the failure of certain Church leaders from the 1880s to the 1910s to understand that the New and Everlasting Covenant was not synonymous with plural marriage. 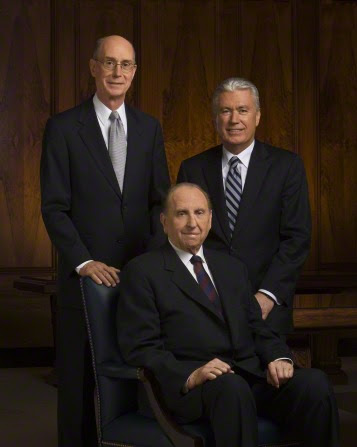 An example cited by Sister Chieko Okazaki in the interview she granted Greg Prince regarded the Hinckley administration was the fabulous decision to come up with a common curriculum for men and women but failing to remember to inform the Relief Society or involve the Relief Society in development of the initial manual. But for every critical suggestion, I think the rule in marriages is to spend 90% of the time talking about the good that is being done, and carefully focus critical comments in a small portion of the comments, reproving betimes (in a timely manner) when moved upon by the spirit (of love) and afterwards showing forth an increase of love. That is the very definition of criticism. The problem is that the academic world teaches us that doing these things is a virtue, full stop. The church says they are fine so long as they aren’t aimed at the church. One of the FMH posters pointed out that one of the apostles said that members will defend the true definition of marriage. She says Elder Nelson is wrong. Still think FMH is not an evil website? Winifred, I think it is bad form to attack an entire web site. I agree that Elder Nelson is correct, but let’s refrain from attacking an entire web site on M*. Thanks. You know, I think Winifred has a valid point. The article on Feminist Mormon Housewives is a case in point” and real-time example of what this excellent article just outlined. Look at the chain of events: Fallentine writes this article. Elder Nelson then speaks at BYU on a tough social issue. LDS Feminists are writing precisely what Fallentine said would/is happening (by saying that Elder Nelson is outright wrong on marriage, is fueling fire, is persecuting other members and weaponizing and destroying members). This is scary stuff, people. The timing of this post is impeccable and inspired. My study of history has shown me that though the evil speaking of today’s detractors may be spread with a breathtaking ease, there are no new attacks, merely variations on the doubts and lies that have been raised since the beginning. Meg, you are of course correct. I bet it you were to translate and update the attacks on Noah before the flood and then the attacks on Jeremiah and the attacks on Lehi, etc, etc they would sound pretty similar to the attacks on Joseph Smith, BY and of course the prophets today. Hugh Nibley had an excellent article showing that anti-Mormon tracts have for decades basically recycled various bogus claims that were made in the 1830s and 1840s and have been proven untrue. The anti-prophet strategy has been, for millennia, to throw everything at the prophets and hope something sticks. The best counsel I have heard about how to disagree or handle grievances came from Jesus himself. He counseled to try talking one on one as a first resort, not publicly lashing out. That being said, that is where a lot of the criticism is wrong, they throw the criticism out to be seen and heard by the world at large. They criticize for public approval and show above trying to resolve sincerely the issue at hand. I find this article to be completely unpersuasive for a myriad of reasons. Re #1: The author’s argument infantilizes humanity and implies infallibility for the Q15. I think most members are perfectly capable of distinguishing the exercise of priesthood keys from the personal behavior of those in authority. I have a father who served as bishop and in a stake presidency and a consequence of my close relationship to him was a keen awareness of his specific weaknesses. Those specific weaknesses generally would have no bearing on the exercise of his priesthood keys (i.e. callings and ordinations, unit organization, church discipline) but in the event that he began to preach on a specific subject with which he struggled or if someone sought out counsel from him in a similar vein then I would myself, and encourage others, to take that advice with a hefty degree of skepticism. Similarly, when dealing with my own children I am far from perfect—they know it and, most importantly, I know it and I readily concede to them that fact. I struggle with a short temper and am wont to dispense punishment (rather than discipline) with alacrity. As a result I spend a lot of time apologizing and at the same time teaching my children that the ability to control one’s temper is a virtue we should all possess. I do not think my struggle with my own temper impairs my credibility with my children (even on this specific topic) because I use my own weakness as an object lesson. They see me engage in the repentance process and we have frank discussions about my own behavior and theirs as a result. Re #2: This is meaningless. What does it mean to “pledge support”? One means of support my spouse provides me is to point out when repentance on my part is required. Does that mean she is failing to sustain me? Re #3: I think this would be better stated more directly as the Q15 is united in its public pronouncements. The quotes the author supplies make it clear that prior to any pronouncement unanimity is not guaranteed. I think the provided quotes also make it clear that a lack of unanimity is not evidence of the influence of the Adversary. I think the Q15 take the counsel contained in D&C 121: 41-46. Re #4: Given that we rely on the Q15 for the retention and exercise of priesthood keys (which is exactly what GBH addressed in the supplied passage) I agree that age is a non-issue. Now, if one looks to the Q15 for advice on dealing with the challenges of the day then the age of those occupying those positions is quite relevant and is completely unaddressed by the author. Re #5: In the movie “The Princess Bride” one of the characters repeatedly expresses his incredulity at emerging events with the exclamation, “INCONCEIVABLE!” One of his companions, slightly confused by the repeated exclamations finally responds, “That word you keep using. I don’t think it means what you think it means.” In a similar vein Mormons tend to use the phrase “evil speaking” incorrectly. Evil speaking specifically refers to slander or presenting as true defamatory remarks that speaker knows to be false. So truthful remarks about past behavior is by definition not evil speaking. Opinions expressed are not evil speaking. The passage from Elder Oaks refers to Jude 1:8 but in quoting this scripture to support his position he is wresting the scriptures. A better translation of that verse reads as follows, “Yet these men, as a result of their dreams, defile the flesh, reject authority, and insult the glorious ones.” Here “glorious ones” refers to angelic beings and more specifically fallen angels as verses 9-11 confirm. The idea that, “Criticism is particularly objectionable when it is directed toward Church authorities, general or local,” has the thinnest (if any at all) canonical support. I write this to highlight that this idea is blazing new ground. I must emphasize in closing that I agree with Elder Oaks’ counsel that there is an appropriate time and place for criticism of Church authorities and I agree with his suggestions for going about it. All disagreement with their ideas and propositions is perfectly valid. The prophet is not a dictator, nor does he promote himself to be. He gives counsel and allows time for people to accept it or not. I’m still invited to follow even if I haven’t accepted or received a personal witness of everything he says as truth. Now, the method in which you express disagreement with the prophet may make it invalid, but not the disagreement itself. For instance, a couple of conferences ago, Thomas S. Monson shared a story which strongly suggested that Thomas B. Marsh left the LDS church because of milk strippings, citing George Q. Cannon’s 1850s account, given almost twenty years after the event. A more detailed review of the available evidence reveals that the Marsh’s departure is more likely to have been over the fact that believed Joseph Smith’s administrative approach in Missouri to have been instigating conflict. Pointing out logical fallacies, inconsistencies, and contradictions in one’s reasoning is critiquing a proposition, which is much different from the criticism spoken of in the OP and also pretty much all of LDS canon. To criticize is to attack one’s character. Passing judgment as to the merits of the LDS church leaders’ ideas is simply a part of being a church member. Elder Oaks is talking of criticism that is intended to tear down the characters of the LDS leadership. I think you make a good point by pointing out that the method of expressing disagreement is important, and I agree, but I think the emphasis in your comments is a bit off. If God wanted us to just make our own decisions about everything with general guidelines he could send us a list of commandments and then leave us alone. But this is not how the system works. God sends us prophets because there are specific issues at specific times that are complex and/or go against the grain of current public opinion, and God wants to make sure we get the message loud in clear for those specific issues. This is why GC twice a year is so important: we get updated by living prophets on the messages that God wants us to hear. Of course we can choose to disagree, and we can also choose to jump from high bridges and we can choose to take a bath with a plugged-in toaster in the bathtub. But the message of the Church is: perhaps you should follow the prophets rather than the self-destructive behavior others are choosing. Disagreement should focus on bringing our ideas in line with the prophets, not figuring out reasons to lawyer your way out of following prophetic counsel. To follow up on that comment, I would ask Steve Smith the following: if prophets make a recommendation *should* we follow it or should we figure out ways not to follow it and concentrate on things like the story of Thomas B. Marsh? What do you recommend, following the prophets or not?